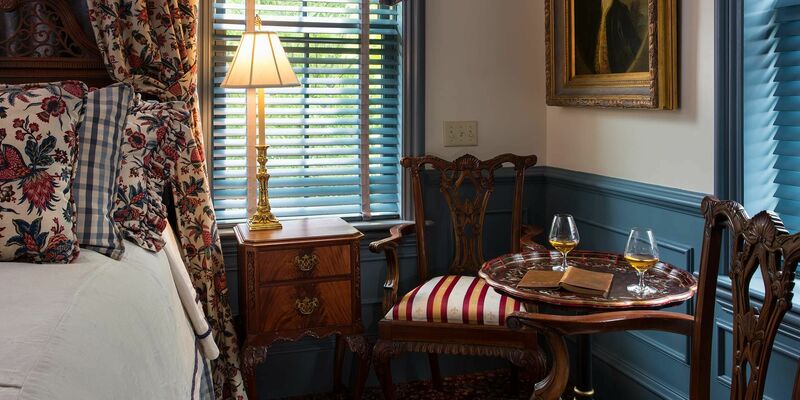 The Williamsburg Room is a gem among Cliff Walk hotel rooms, featuring a style that stems from post-Revolutionary America including Colonial Williamsburg floral prints of red, white and blue. This elegant room offers relaxing garden views and an alcove complete with a Jacuzzi tub. 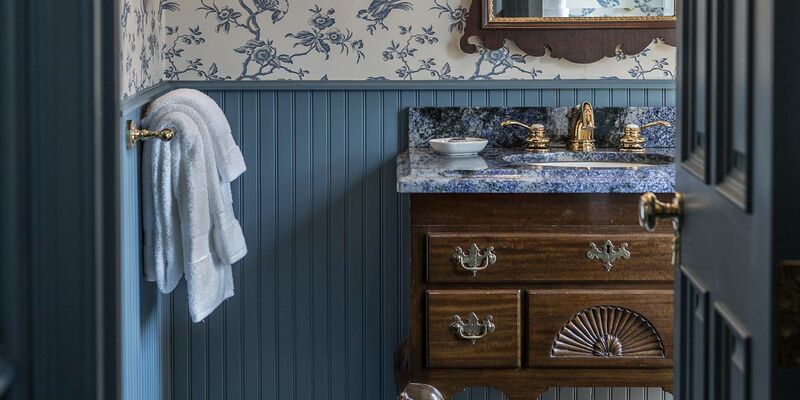 The superbly appointed marble bathroom includes a Queen Anne vanity, flat-screen TV, and seven foot shower with multiple shower heads and body sprays. 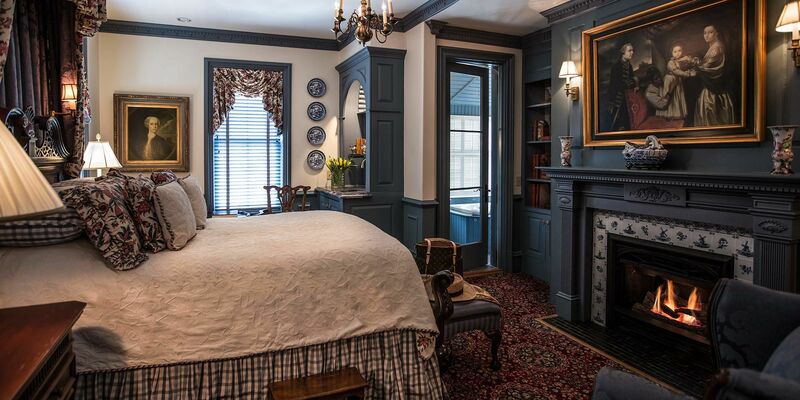 The Williamsburg Room greets guests with fine furnishings including a Chinese Chippendale queen four-poster bed. 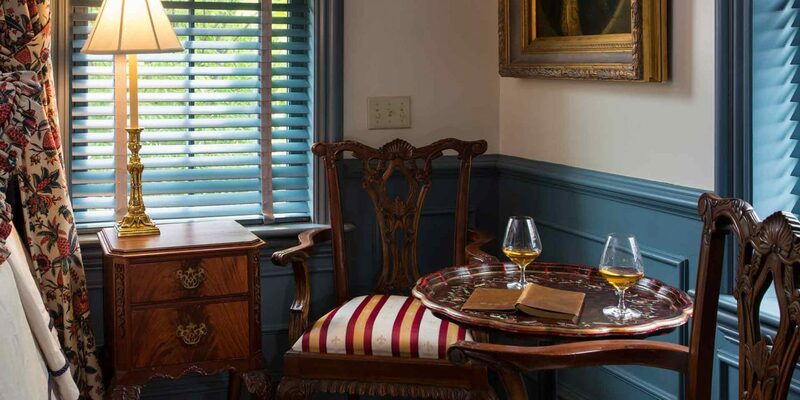 Ideal for guests seeking flexible hotel accommodations near Cliff Walk, Williamsburg can be utilized as a two-bedroom suite when reserved with the Federal Room. The Williamsburg Room is located on the second floor and requires climbing one flight of stairs. Please note: The Chanler does not have an elevator. The jacuzzi was so relaxing after a day of seeing the mansions and walking along the Cliff Walk. Don’t miss an opportunity to relax by an antique fireplace after a long day of exploring Newport shopping and dining.